The ultimate homebrew bottle is here! 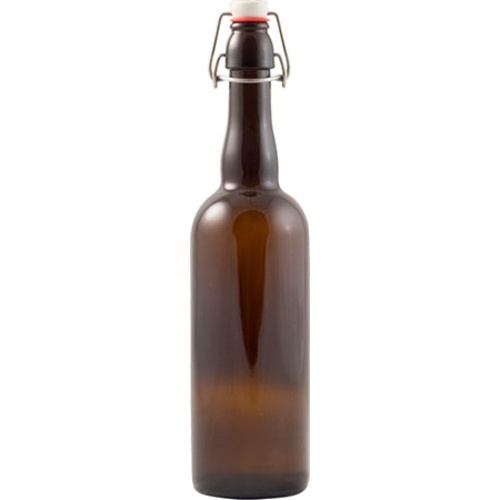 These awesome new swing top bottles can take either a standard 26mm crown cap or a swing top. Cap your beer at bottling and throw a flip top on if you don't finish it all. Crown caps provide a better long term seal, protecting your beer. The flip top functionality turns this unit into a growler whenever you want! Rated to 4 gas volumes. Note 2: Hand held (wing) cappers do not work with this bottle as the neck is too wide. Bench / table cappers work great! Dark color protects beers, ease of use. Love these. The swing top is a big plus! Bottles are solid but the rubber lid seal seems glued on. These will need to be changed eventually and not sure if they will come off easily when I need to. Didn’t realize how tall they were or how heavy. Look more like wine bottles. Should have gotten smaller bottles. Great for presents, filled with homebrew! I used these bottles with great success for Christmas presents. Although finishing a liter of beer isn't a real problem in my home, some of my friends and family like to pace themselves. This was a great way to share my beer leaving them flexibility, and a liter growler to refill at their local craft brewery. The swing tops are good because they are reusable. I got them at a good price on this site. When I expand my brewing I will probably get more. Bought these for my husband for Christmas. He loves them!! So much easier than putting caps on bottles. More bottling work, but much easier to handle than 32 oz or 1 liter bottles. Also at about 2x12 oz they are a perfect evening drink.